Mira Rajput is definitely one of those people whose actions make it to headlines on a daily basis. This time she is in news because of her Instagram account. 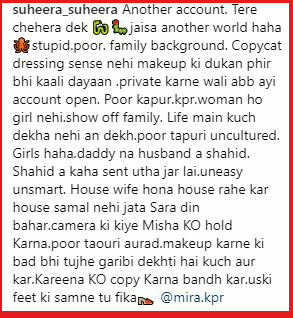 Mira made a new account on the photo-sharing app and did not keep her pictures private, unlike the earlier one. The first picture which Mira posted was of husband Shahid Kapoor and daughter Misha. One would expect Mira’s first picture to get loads of love from people using the app, but sadly it did not happen. Many trolls spewed hatred against her. Many called her a gold-digger and shamed her for the choice of clothes and makeup. This incident is yet another proof that trolls are jobless. Bombarding a celebrity’s timeline with filthy comments is their only task it seems. Despite getting a befitting reply from celebrities on multiple occasions, they do not seem to learn a lesson. Actresses like Esha Gupta, Taapsee Pannu and ace designer Masaba Gupta have found themselves at the receiving end of such filthy comments. But they did not bow down to such hatred and stood up for themselves. 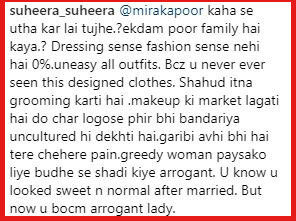 We wonder how Mira will react to trolls dissing her.